Here we are going to see how to add or subtract two rational expressions. Like adding and subtracting two rational numbers, we have two methods to add or subtract two rational expressions. (ii) Write the sum or difference of the numerators found in step (i) over the common denominator. (i) Determine the Least Common Multiple of the denominator. (ii) Rewrite each fraction as an equivalent fraction with the LCM obtained in step (i). This is done by multiplying both the numerators and denominator of each expression by any factors needed to obtain the LCM. 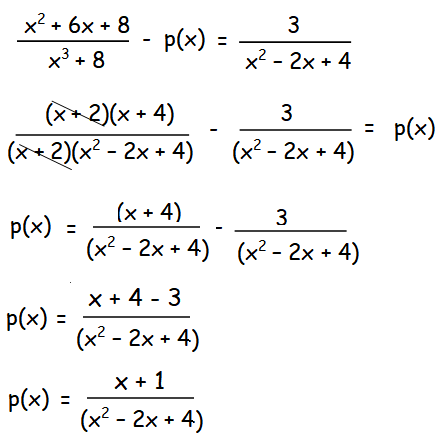 (iii) Follow the same steps given for doing addition or subtraction of the rational expression with like denominators. Let p(x) be the rational expression should be subtracted. Now let us apply the values of A and B. After having gone through the stuff given above, we hope that the students would have understood, "Addition and Subtraction of Rational Expressions Examples". Apart from the stuff given in this section "Addition and Subtraction of Rational Expressions Examples", if you need any other stuff in math, please use our google custom search here.